Container was first introduced in Sun Solaris operating system but now it is widely available in Linux and Windows as well. The container is an isolated area where an application can run without affecting the rest of the system, and without the system affecting the application. Container shares operating system's kernel so it can be configured as “isolated” part of guest OS. 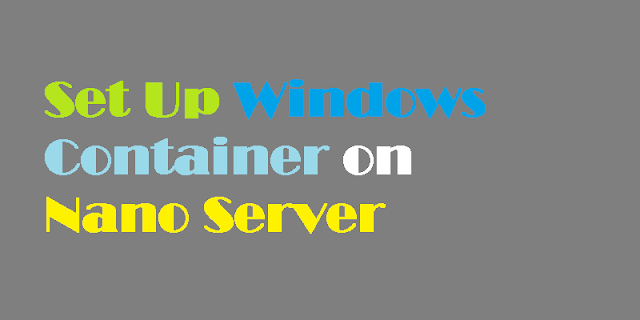 Windows Server Containers – A Windows Server container shares a kernel with the container host and all containers running on the host. Hyper-V Containers – expand on the isolation provided by Windows Server Containers by running each container in a Hyper-V virtual machine. In this configuration the kernel of the container host is not shared with other Hyper-V Containers. This article will guide you through the steps to set up Windows Containers on Nano Server using PowerShell command line. You need to set environment variable which does not require shell to be restarted. I didn't know that, container was first introduced in Sun Solaris!